For 100 years, the United States has taken living on this planet for granted; we have been the leader in culture, economic growth and military security. That changed over the last two decades as we’ve lost our focus, our discipline and our spirit as a free people. The world that once loved to be like America has turned into an adversary of it. Something must be done at home before it can be expected abroad. Our economic might won WWII, destroyed Communism and created the largest middle class and wealthiest upper classes in the history of mankind, lifting millions out of poverty and creating a world where even the poor have alternatives to starvation and homelessness like nowhere else. We watched for decades as the world grew eyes on the back of their heads and lived in fear, as Ireland, Southeast Asia, Israel and countless other skirmishes and civil wars battered free and oppressed people alike. Never once did we feel threatened here at home, and comfortable was the life we and our parents had built for ourselves. That changed on an infamous day we all remember too well. Frequently, because of our historic position, we’ve been drawn into diplomatic or military interventions around the world, in allied attempts to manage a buffet of conflicts: rogue army, dictator, failing economy. This approach worked for many years but has seemingly veered off the last two decades, despite clear resolve and decisive action under the Bush administration. And now we’re paying for it in more ways than one. Last night, at the CNN/Heritage Foundation/AEI debate, the focus was on national security and foreign policy. Many questions arose regarding how we deal with current dangers like Chinese influence, indignant Iranians and unity in Israel and productivity in Pakistan. 20 minutes and 27 seconds into the debate, Rick Perry defined a potentially HUGE foreign policy concept that should have everyone chattering today: Trade Zone Containment. Contain national security threats by focusing on what motivates us, not by what we disagree on? It’s a fundamental of diplomacy: focus on your strengths, balance your weaknesses. Condoleeza Rice brought a sense of history to her role as Secretary of State like few before her, and this helped her understand the strengths and weaknesses inherent in each culture we approach. I believe we need to expand on that, and lead from the front – we need to SHOW the world what exceptional nation building is, by doing it for ourselves. Texas has already worked on developing some form of foreign trade zones, so he has experience working on this already. It bends the steel in our minds, cast by past blunders and successes. It forces us to self-evaluate. What we do at home directly affects our ability to do anything abroad – a self-perpetuating conflict that is dragging us down a slippery slope. The lack of energy independence has created necessary evils we should never have needed to face. If we feel forced to choose between the lesser of two, it’s not because of our own evil nature – we are a great nation, with exceptional people – but because of neglect, collective detachment, or any number of interpretations. We really need to reevaluate our priorities, many of which are based on theory, ideology or just plain ignorance. Energy independence and responsible regulatory overhaul is necessary, immediately. When we begin to rebuild our country from the deep, dark inside out, the world will build itself in our image because freedom always wins and people will always choose freedom over oppression if given the choice. There has been an innate tendency to drift toward a police-protectorate mentality – under both Parties, I might add – an assumption that tragedy around the world must be met with American Exceptionalism, either with the barrel of a gun, or the threat of it. Bosnia, Somalia, Iraq, Libya, take your pick. Bosnia showed American weakness when Clinton was virtually shamed into action by British Prime Minister Blair. Somalia showed our lack of focus. Iraq showed our lack of influence with the EU. Libya simply showed our complete lack of resolve on anything – “Leading from behind” is now a sure tongue-in-cheek entry into the political lexicon for years to come. Even the Bush Doctrine, or preemptive nation-building, radical as it seemed at the time, proved to be tasty treats for both sides of the Establishment aisle, and didn’t accomplish what it intended because of a lack of worldwide support. It also gave a new life to a struggling movement among the anti-war crowd that perennially gifts Ron Paul an excuse to run hopeless campaigns. There has been something missing in our approach to world affairs, and the world doesn’t seem to listen, the same as they used to. We are in a conundrum, as a nation: we have vital national security interests across the planet on nearly every continent that must be protected. However, a growing sentiment of frustration across the world has raised itself in contrast to our presumed “exceptional” status, and prompted many at home to question our purpose in the world, and our mission as we engage other countries economically and militarily. Nation building has now lost its support among most in the establishment now, and never found footing among the more fringe wings of the left or the right. So, in a post-“terror war” world that is nonetheless just as dangerous, what are we as a nation to do? How do we still contain the threats and focus on domestic growth at the same time? How can we continue to assert ourselves for the purpose of protecting the future of the American supremacy which led to the safest, greatest union of free people in the history of the world? If we do not find an answer to the first question, the first domino that has already fallen will be forgotten in the torrent of future conflict sure to follow. Foreign policy is like herding cats. Why must we be forced to pick our battles? I believe it is possible to find a way for those battles to contain themselves, while addressing security threats around the world without further inflaming the people we intend to set free. 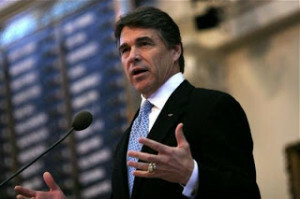 Fortunately, we have an answer that is worth trying here in the U.S. with what Governor Perry has proposed. Enemies are almost exclusively motivated by one thing: Power. And money creates power. The Chinese learned this, and they wised up to opening their 1.3 billion individual economic engines to the world trade juuuuuust enough to spark an economic boom that now soon threatens U.S. Supremacy. 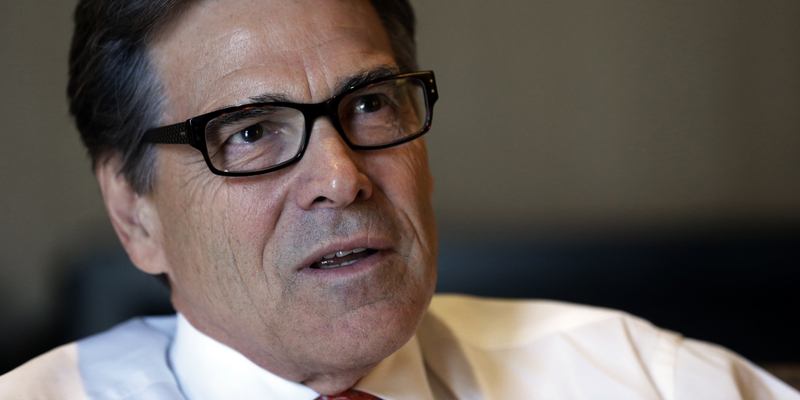 Perry’s suggestion seemed to roll of his tongue so naturally, as though it was assumed Conventional Wisdom. It shouldn’t have been such a surprise to me. This is the fundamental way he’s led all his life as a public Executive in Texas. But it has rarely been tried, and never successfully as a major policy initiative. Other countries have done the same thing, to great annoyance of our own homeland. Think about it: Venezuela’s Hugo Chavez succeeded in turning what was once a very cordial hemispheric relationship between the United States and Latin America into a noticeably stiff-necked opposition to American diplomacy. He did this by using energy sources and a trade bloc to create unity in mutual economic growth. Second case: The EU learned to become more independent from the U.S. by unifying their economies into an almost do-or-die currency program that has created foreign policy complications for the United States for 10 years. The EU has, in turn moved toward more economic interdependency with Chinese and Japanese interests like never before. We seem more interested in either appeasement in our security interests or flag-football war. Both accomplish nothing; both diminish our respect. Our lack of focus and self-control has led to less impact on world affairs that affect us than ever before. As economic policy moves, so moves foreign policy. Case in point: The U.S. is locked into two unpopular conflicts, two more potential ones, and one that recently ended with less than congratulatory applause.What led to this stalemate? American dependency on foreign oil, and the devaluation of our dollar. We have no position of strength in dealing with Iran, Libya, Syria, Korea and perhaps most consequentially, China, when we are broke, contradictory and addicted to self-deprecation. We must eliminate this sadistic dependency on foreign sources of energy and return our dollar to sound footing. The result will be a dramatically stronger position for our foreign policy objectives. Rick Perry’s bold suggestion has the power to completely transform the next 100 years of foreign policy and American economic dominance. Now, the only way this can work is for the following to have occurred first, before it could work. Fair and competitive corporate tax rates and regulation to return investment to the U.S. When the American economy returns to its perch atop the world, we will be able to approach a region like Pakistan, Afghanistan and India with the knowledge, power, stability and respect, invest into their region and receive a solid return. It’s fascinating that the best ideas appear to be coming from an off-hand debate comment.It would hedge our threats in Iran and China simultaneously, it would create indisputably more harmony between currently feuding interests. Also, we’d gain three or more trading partners with massive potential for inflowing dollars, rather than the broken ATM we have become instead. Why has America stagnated from being the supreme leader in the world? We used to dominate the world stage by virtue of being followed by everyone. Are we now the beleaguered mediator between factions and “last great hope” or merely the also-ran culture that once drove the 20th century but cannot even educate its own children or pay its own bills today? Those are both undesirable positions to be in. We must return to the place of setting the standard world wide of what a God-fearing, free people can accomplish. Then, and only then can tyranny and ruthlessness be met with equal determination and winning strength. Without independence in energy, State, not Federal-determined education and excellence (not needing H1-B visas to fill swaths of empty jobs here in the U.S.), we will never be able to exert our influence around the world again, other than simply slapping a predator drone or cruise missile up the back end of an annoying head of state. America was lifted to the position of world power by virtue of our success, our stability, our character. We were a leader because we were followed, not because we simply took initiative. For decades, the U.N. was merely an unnecessary but feel-good cocktail circuit because the world looked to an American President for direction, strength and economic support, not a committee with competing interests. It is in our best interest as a people to be at the top of the world economic ladder; the primary LENDERS in the world, not the primary DEBTORS. This return to American Exceptionalism must occur for us to secure the future for our children, both in safety and economic security. If we put the reforms into place suggested above, sooner than later, maybe it will even give OUR generation the future in time our parents had promised for us too. Right now, the goal of the Republican base must be to nominate a candidate who not only has the ideas practically falling out of his mouth, but has the experience and the resolve to move us in the right direction. A lackluster, back-footed administration must not be tolerated at this important crossroads. We need a dynamic foreign policy fueled by American economic expansion, and it must happen NOW, in the next decade and it begins by setting ourselves free to be who we are. We are a nation of diverse culture, incalculable knowledge and limitless energy. Now it’s time to make what Americans buy, buy what Americans make and sell it to the world. If we do it right, the world will be knocking down our door to get what we’ve got. And we’ll all be safer too. 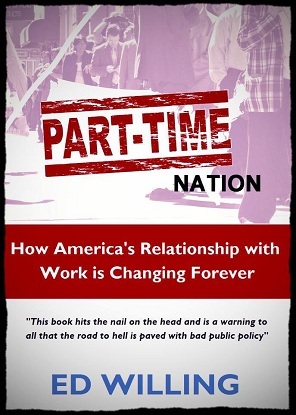 Ed Willing is a freelance writer, small business owner and political activist from suburban Racine, WI and formerly served as NW Youth Coordinator for the Buchanan for President Campaign. Paulette Miniter was gracious in assisting with the content of this article. She is a contributing author for the Washington Times and other online publications.